Get the Most out of Your Music with This Keyboard Controller! The Akai Professional MPK88 MIDI keyboard controller gives you the power and flexibility to get the most out of your instruments — onstage or in the studio. The 88-key MPK88 gives you a fully weighted hammer-action keyboard for incredible feel and expression, while its 16 onboard MPC pads provide velocity- and pressure-sensitive control. You'll also appreciate the array of assignable knobs, faders, and buttons, as well as handy transport controls and pitch and mod wheels. Built to work wonders for a vast range of players, the MPK88 is a real performer. 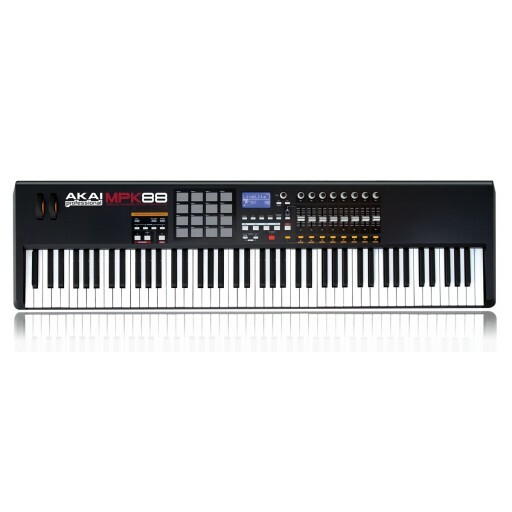 MPK88 features an 88-key keyboard and 16 genuine MPC pads. The hammer-action keyboard is fully weighted and features aftertouch for expressive melodic control. The MPC pads are pressure and velocity-sensitive to capture every nuance of your creative concepts. The pads can access four banks of sounds, so you have 64 samples at your fingertips with the touch of a button. The MPK88 places dedicated transport controls within your reach for easy control of some of the most important tracking and editing controls. The MPK88 has modulation and pitch-bend wheels for expressive musicality, and two assignable footswitch inputs enable you to connect an expression pedal or other continuous controller and a footswitch for momentary controls like patch change or start/stop. The MPK88 has Key Split, enabling you to control two different sounds from the same keyboard. On top of MPC technologies, the MPK88 has its own arpeggiator, which enables you to create quick, creative riffs in seconds. Just pick a note or chord and a rhythm pattern in the arpeggiator's library and the MPK will play your notes in the rhythm and sequence you choose. The MPK88 also has MPC Full Level and MPC 16-Level on its pads, as well as Tap Tempo and Time Division so you can nail the tempo, timing, and dynamics exactly as you hear them in your head.